“There are two things that are common to most people: we all want gorgeous hair and we all have at least one hair issue,” said Jawed Habib as he began the Hair Yoga workshop organised by the Navhind Times Planet J. 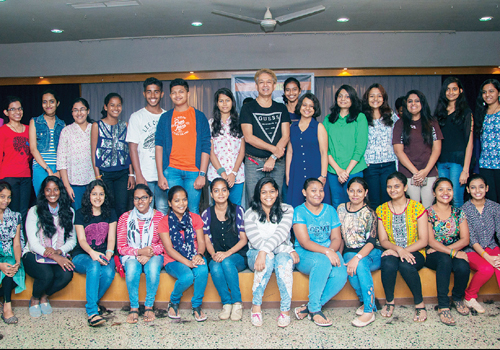 The half-day workshop was held at Dempo House, Panaji on December 18 and more than 100 students in the age group of 14 to 22 participated along with a handful of parents. “Hair yoga is all about looking after your hair. If the right clothes and grooming can alter a personality, then the right hair cut also does wonders. It is not just a hair cut that has to be considered because after that comes caring for your hair that matters,” said Habib. After the initial introduction to the concept of Hair Yoga, he spoke about hair types and reiterated the importance of knowing one’s hair type. “Once you understand what hair type you have and what it needs and requires, half your hair problems will be solved,” he assured participants. He then explained the types of hair, namely- dry, oily, normal and composite and gave invaluable tips on how to take care of it. While giving haircuts to excited participants he also explained how the Goan climate affects hair and how excessive use of oil clogs the pores which in turn give rise to dandruff and other hair issues. “Use oil every day but wash it off after about 5 to 10 minutes do not keep it overnight,” he repeated. Debunking some myths, he said: “Shampooing your hair every day is good as it keeps the pores clean and allows for better hair growth. However if shampoo is left in the hair, it can be harmful. Hence thorough rinsing is extremely important.” He also elaborated on styling products and their use and highlighted the importance of applying these correctly. Next on the agenda was pre-conditioning and conditioning. He explained the benefits of both and the process of shampooing hair. “Ensure that the scalp is clean when you are shampooing and this can be done by firmly massaging the shampoo into the scalp,” he said. On the topic of haircuts, he reiterated the need to choose according to hair texture, shape of the face and features. “A balanced cut is what I recommend for all. Don’t go for cuts simply because it looks good on someone else,” he said. With over 40 haircuts done under three hours, Habib’s shears’ expertise came shining through.